Gregor Townsend says six of his Scotland internationals are delighted to be back in the Glasgow Warriors squad for Friday's match with Leinster. A further 15 Warriors were involved in the Scots' Rugby World Cup campaign. And the Glasgow head coach believes there will be longer-term benefits from having had so many of his squad on international duty in England. "The 21 players will come back and we'll be a better team," Townsend told BBC Scotland. 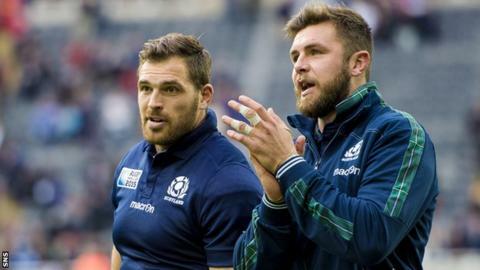 Scotland quintet Sean Lamont, Tim Swinson, Richie Vernon, Duncan Weir and Ryan Wilson start against Leinster while Kevin Bryce is among the replacements. Townsend says it will become clear in the next couple of weeks whether rugby in Scotland will suffer a World Cup hangover or be on a high. "The whole nation was behind Scotland and, with Edinburgh unbeaten in the Pro12 and ourselves starting well performance-wise, it's up to us to keep it going," he explained. The former Scotland back also commented on the controversial refereeing decision to award Australia a late penalty in Scotland's quarter-final defeat on Sunday, with the three points giving the Wallabies a 35-34 win. "I can understand why he went for that call," said the 42-year-old about referee Craig Joubert's decision. "It may have turned out to be the wrong one. But, as an ex-player, I'm not going to criticise a referee. "I made plenty of mistakes as a stand-off on the pitch. "I think, in general, the standard of referring at the tournament was high."